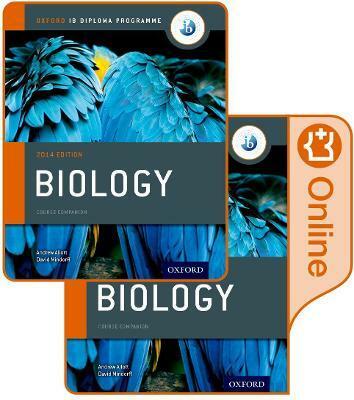 The most comprehensive coverage of the 2014 syllabus, this resource pack includes a print and online Biology Course Book, for fully flexible learning. Giving you unparalleled support for the new concept-based approach to learning, the Nature of science, understanding, applications and skills are integrated in every topic, alongside TOK to drive inquiry and independent learning. Assessment support directly from the IB includes practice questions and worked examples in each topic, along with focused support for both the Internal Assessment and Extended Essay. Truly aligned with the IB philosophy, this Course Book gives unrivalled insight and support at every stage. This pack includes one print Course Book and one online Course Book. The online Course Book will be available on Oxford Education Bookshelf until 2022. Access is facilitated via a unique code, which is sent in the mail. The code must be linked to an email address, creating a user account. Access may be transferred once to an additional user. Andrew Allott was an IB Diploma student in 1974. He has since acted as an IB Advisor and worked extensively on IB curriculum review. He is currently Head of Biology at Shrewsbury School, UK. David Mindorff is an IB Coordinator and Head of Academics at Lyford Cay International School, Bahamas.